Although summer is officially over, there's still some time for one last trip to the beach or one last outdoor picnic before the weather starts to get too cool. 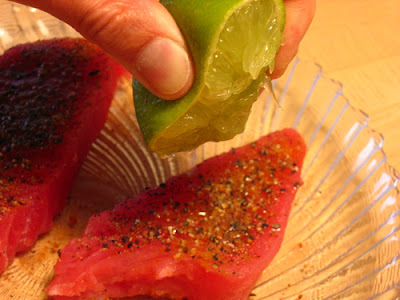 So in keeping with that theme, we're going to write a late-season post on casual foods for the outdoor grill. 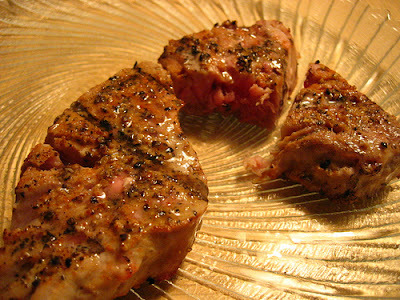 Our featured dinner is grilled tuna steaks, which we made on our end-of-summer beach vacation. 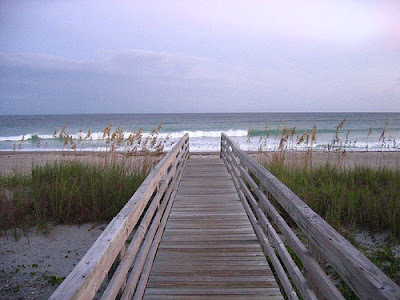 I don't know about you, but when we go to the beach, our main goal is to decompress. The only "work" I want to do is to get up and get myself a beer, or turn the pages of the book I'm reading while I'm listening to the ocean. Occasionally, I'll even think about throwing my Blackberry into the ocean, like that famous Corona beer ad. So when dinner time rolls around, we want to get it on the table with a minimum of labor. Of course we want a nice meal, but even more, we want to get right back to the important task of not doing anything. One meal that's become a staple for our annual beach vacation is grilled tuna steaks. 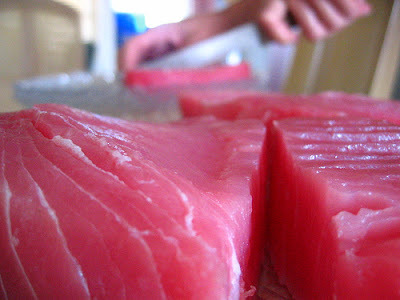 They're just a little bit exotic, but in reality they're laughably easy to make (although I must say, they are not laughably cheap--tuna steaks can cost several dollars a pound at your local grocery store or fish market). Here they are, fully seasoned. Note the absolute absence of any salt. That was really hard, time-consuming work, wasn't it? 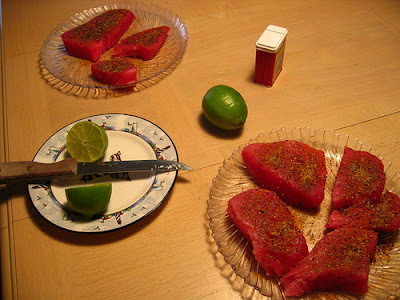 Our final step before heading to the grill is to coat both sides of each steak with a generous amount of lime juice. 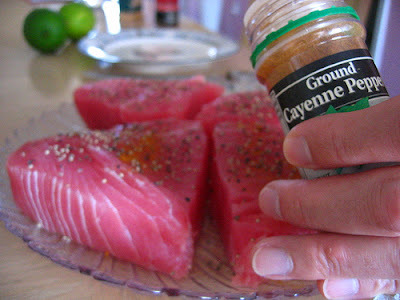 However, do not do this until just a few minutes before you put them on the grill, or the acids in the lime juice will start "cooking" the tuna. We're not making ceviche here! In terms of cooking these guys, they are kind of like burgers or regular steaks--there's a bit of a "feel" to grilling them. And I'll confess, since I make these once a year and only once a year, I've never really gotten the feel down quite yet. So usually, I inadvertantly sear them ruthlessly on the outside and leave them totally raw on the inside. But the great thing about tuna steaks is that's exactly how I like them--and better still, you can feign food snobbery by saying they're supposed to be that way! Ah, food snobs. I love taking advantage of them when it matches my poor grilling skills. 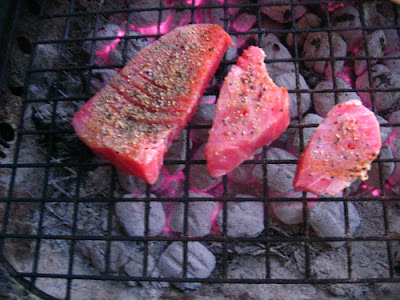 Of course for the remaining people in your dinner party who don't want their tuna steaks mooing (or making whatever noise live tunas make), you can always leave them on the grill for a few minutes longer per side. This is a dish that will please and impress your family and friends. Minimalist magnificence! 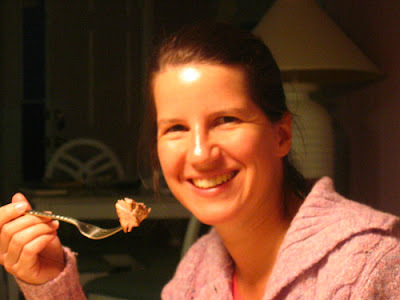 CK, you are the Mark Bittman of the Blogsphere! There is always the temptation to do too much (marinade? sugary sauce? the outrage!) to such a beautiful piece of fish. You rightly resist this and the payoff is clear. Adrienne's step-dad is up in Niantic and does a lot of fishing out at on the eastern end of LI Sound. Lot's of yellow-fin there. We are spoiled. Is a wasabi-crust too food-snobbish? Thanks Mr. The Sieve for your comment and the positive vibes! 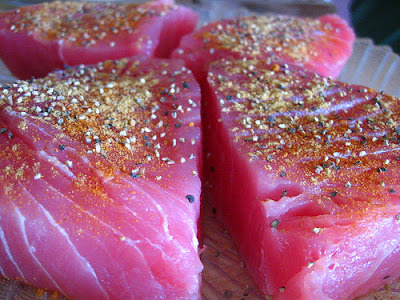 I have to admit I'm not a fan of the wasabi-crusted tuna... it seems to me to be both food-snobbish and oh-so-15 minutes ago. Doesn't everybody already make that at trendy restaurants? Of course maybe deriding wasabi-crusted tuna is in itself a food-snob thing to say? Why no salt is to be added? 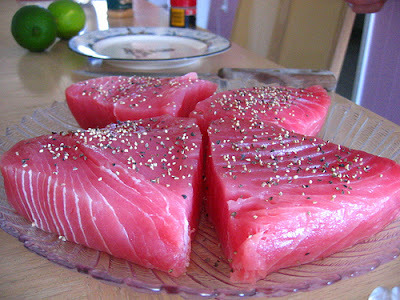 Is raw Tuna meat salty by default. Canned tuna is not salty. Joydeep, you're more than welcome to add salt, but I believe grilled tuna doesn't need it.